Hunguest Hotel Helios***superior is situated in the middle of a 4,5-ha-large well-kept nature conservation park, 500 m far from the thermal lake. The world famous thermal lake of Heviz with its largest water surface in Europe offers open-air bathe during the whole year. Its curative effect reveals principally in curing of rheumatological and locomotor diseases. The two buildings of the hotel, Helios ANNA and BENJAMIN are connected each other with a heated corridor and have a unique ambience. The rooms and suites in the air-conditioned Hotel Anna (main building) have bathroom (with bath tube), toilet, balcony, television, minibar, telephone and safe. The rooms of Hotel Benjamin are equipped with shower/toilet, television, minibar, telephone and safe. Bathrobe use is free of charge. Why is it worth visiting Hotel Helios? 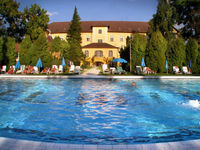 The hotel is situated in the middle of a 4,5-ha-large well-kept nature conservation park, 500 m far from the thermal lake. 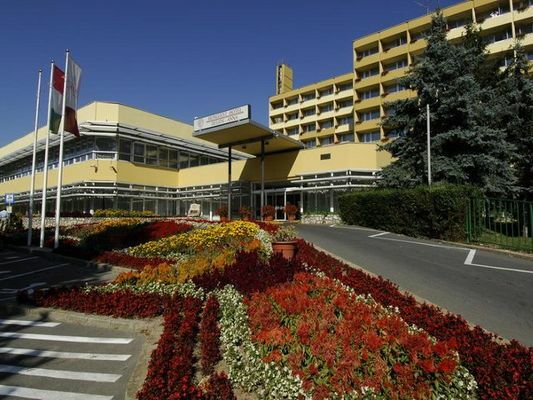 The *** superior hotel has its own medical centre with indoor thermal pool and special staff. You can pamper yourself with a wide selection of wellness and beauty services: infraredsauna, solarium, salt chamber, resonant music therapy, Cleopatra bath, aromabath, cosmetics, hairdresser's salon, manicure, pedicure, refreshing sole massage. Unlimited use of bath: fun bath, jacuzzi, suana, infraredsauna, steam bath, scottish shower, steam rock, Kneipp basin, use of fitness room, daily free sport programs, in summer open-air swimming-pool, garden chess, petanque, organizing of trips and programs. For children are available playground and pool for children in summer. The hotel has own wellness section with fun bath (water temperature 34-36 C, water stream, neck shower, scottish shower, water jet), in the summer open-air swimming-pool (25 m x 13 m, 24-27 oC) and pool for children (35 oC), jacuzzi, sauna, infraredsauna, solarium, steam bath, scottisch shower, steam rock, diving basin, Kneipp basin, salt chamber, resonant music therapy, gymnastics studio, fitness room, daily free sport programs, aroma massage, ayurveda massage, Scen Tao massage with lavastones, Claopatra bath, aroma bath, cosmetics, hairdresser's salon, manicure, pedicure, refreshing sole massage. • Full board is available at 4200 HUF per person. • The hotel's own parking lot is available for the guests at 500 HUF per car per day.